I recently overheard someone referring to ‘me’ time. I thought to myself, “What in the world is ‘me’ time? My days are spent running from one place to the next for my boys or my church. Weekdays, weekends, all filled with LIFE and activities. Other than taking a shower, getting dressed, and my prayer time, I can’t really recall time that I spend that benefits me alone and I am not really sure I desire that. I really love doing for the amazing people in my life and I really think if I scheduled ‘me’ time that I would not enjoy it because I would be feeling guilty on what I really should be doing. However, in reviewing the calendar, which is the means by which we manage the craziness…. I noticed that the calendar is full, very full. I find myself in those rare moments of downtime, reading or trying to find tools to help me be more productive. Are you kidding me? How much more productive can I be? I’ve realized that I am VERY productive and so are my kids, maybe TOO productive in fact. Last Saturday, I went to Costco for the first time. I was in love from the moment I started seeing all of the organic selections. I must have been the talk of Costco as I went through the aisles of store with excitement, saying out loud, “Wow, look at this!” (Yes, I was alone.) However, as I turned the corner by the frozen section, I spotted this craft gift set for children to make their own pottery. I literally felt a whiplash of emotions as I gazed at the craft set. You see, I am not a crafter. In all honesty, as a homeschool mom, I disposed of every ABeka art project from Kindergarten on up… No turkeys made out of your hand, no Popsicle stick houses… Core subjects and Bible quizzing were our top priorities, but somehow things like arts and crafts never made the list. But now, it has hit me like a ton of bricks, right in the middle of Costco. My babies are grown up. While we have not left one stone unturned on the important stuff, I feel a mad rush to do crafts, goof off, and make as many more precious memories as possible. Every time my mom calls me, in her soft spoken southern drawl. she asks, “Honey, are y’all having any fun?” I always redirect to all of the meaningful things we are doing. Not anymore… I know she is proud of her grandkids and their accomplishments, but today her question drives me, because I realize that SHE KNOWS. She knows when it is all said and done that it is truly important what you put into your kids, but you also need happy times and silly memories to attach to those nuts and bolts. So, today is a new day!! I can’t say that I am going to plan any ME time, but I definitely see more US time in my future. We will keep doing all of the important stuff, but this momma is planning some FUN….yes, even crafts. Just like the important stuff, if we don’t plan it, then we won’t do it. You younger moms, learn from me. It is all important…seek balance, be diligent, and have some FUN. “Me’ time can come when your kids are grown! Have the inmates taken over? I was twenty something and a sales manager at a leading business journal. It was a long time ago, but I am pretty sure I was the youngest member of the management team. My Publisher was a very distinguished gentleman who didn’t communicate with me often and when he did, I either felt great or not so great. There really wasn’t any in between. He had a beard and he was always fiddling with it. I think he was super revved up on nicotine most of the time. If you needed him, you would have to locate him on the smoke deck of our mid rise building on 610 Loop. He was a global thinker, a strategist of sorts, and didn’t really have time to discuss minor details. He was a veteran in the publishing business and his experience and success leered over me like a dark cloud of intimidation. Sometimes when I was feeling really smart and vocalizing my ideas, he would pat me on the head. Yes, you heard me right. I am a grown woman, not a puppy, and you are patting me on the head?? It was very humiliating to say the least. I would ponder, “Why did I leave sales where I was a selling machine?” My worth was so definable back then? You sell the most, you earn the most and you are the most respected. PERIOD. Now, I am responsible for the sales of a group. Some of my sales people are motivated and some are not. Those were days where I learned many lessons, even a parenting lesson. I don’t remember exactly what spurred the response, but Mr. K’s reply to me was, “Have the inmates taken over?” He had a way of making you think about things. Had I lost all control over my department? Had I failed as a leader? I decided to take the bull by the horns and LEAD. I was no quitter and they were paying me to run this department. Since I have been a parent, I have been reminded of that statement often. I remember one time when I had a young girl helping me homeschool the boys a few days a week. She came to me downtrodden one day and said, “Sister Mindi, I don’t know what to do because Dylan will not do his work and keeps telling me to make him snacks.” In other words, the inmate had taken over. LOL. Sure, I could have taken over and disciplined Dylan. However, she would have never been able to lead him, which was my ultimate goal for that season. She needed to take the authority she had been given and not bow down to a six year old. It may seem silly, but how many parents do you see that have no control over their kids? They chalk it up to them being strong willed or wanting them to be a free thinker. My kids were not born behaving. They were all strong willed in their own way, but that was no license to rebel or act like a fool. I was in Ross over a year ago. A toddler boy was screaming his lungs out and totally disrespecting his mother. He wanted a toy. This went on for what seemed like an eternity, but in all actuality it was probably twenty minutes. By the time I was at the checkout, I saw the lady and the boy in line. She was buying him a toy… EPIC FAIL!!! It took everything I had not to go take that toy from that boy and say when you learn to behave then you will receive a reward. This mom just made a major mistake. Crying + Fit = Toy. Not in my house…. This may sound harsh to some, but my thought is that God gave you children to mold. Until they are grown, they need ongoing molding and He has trusted you to do it. In the terms of Mr. K, they are your inmates and you should not let them take over. You have to take over and control what they do when they are little. You wouldn’t let them play in traffic, so don’t let them do other things that are harmful to their character. My kids are not in control of our household, of me, or my husband. Children appreciate clearly defined rules. You are not being mean by disciplining them or even spanking them, you are doing them a HUGE favor. They need to learn how to behave as they were not born knowing this. It is not something that will just happen at a magical age. You have to teach, teach, teach and then teach some more! Early on, you must establish respect and authority for both you and your spouse. Never undermine your spouse’s authority in front of your children. We don’t abuse or ask too much, but they do what we ask them to do and it is not up for negotiation. They must have consequences for their actions, both good and bad. The first few years of parenthood was intense with three little boys, but I have found that if you will be consistent and not give in when they are toddlers then you will mainly just be reinforcing in the years to come and it will make your life so much easier. 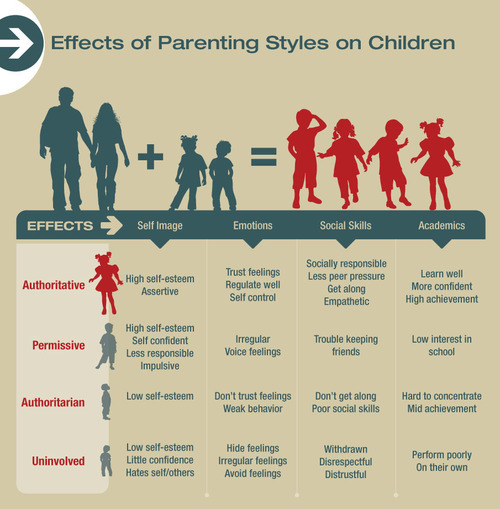 Look at this diagram at how a parenting style can affect a child. I’m not advocating being an authoritarian by any means, but I do believe in being authoritative and supportive. There is a difference. As for behaving in church, I remember a time where I was taking the boys out to discipline them and then staying with them in the foyer so that they didn’t continue to disrupt the service. However, the pastor said that the kids wanted to get in trouble so they could go play in the foyer. So, I began either disciplining them right there in the pew or taking them out and then immediately bringing them right back into service. I believe in my kids, so I have always expected a lot out of them. As toddlers, I believed they could learn to sit still in church, be quiet and even learn to praise the Lord. I wasn’t just motivated by making them not disturb other people, but I was training up the next generation of Apostolics and teaching them that we are in the sanctuary of the Most High God.